Indo-Greek, Bactria, Agathokles, 171 to 160 BC. 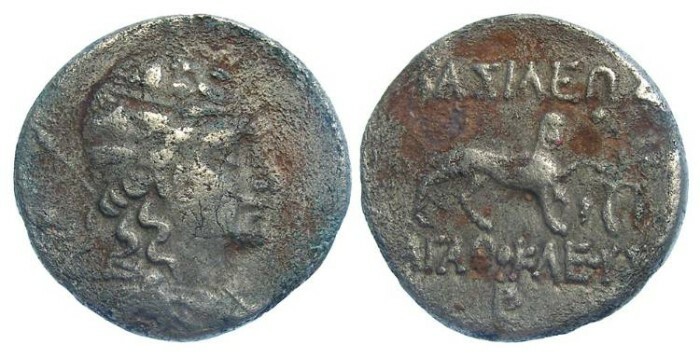 Cupro-nickel didrachm. Denomination : Cupro-nickel didrachm. These coins are struck on an naturally occuring cupro-nickel alloy from Afghanistan, and in spite if appearing bronze like today, they were probably a silvery color when freshly minted, and most like circulated as a silver denomination (a didrachm of about 8 grams). But many reference list them as bronzes, as then found today they often have a patina similar to ones seen on bronze. Size : 21.3 x 22.3 mm. Weight : 7.35 grams. Reference : Sear-7557. MACW 1684 var. Grade : VF but with the typical rough surfaces. Obverse : Bust of Dionysos right. Reverse : Panther walking right, with a vine branch to he right, with BASILEWS AGLQOKLEOUS in two lines above and below.